We are less than a 20 minute drive from Disneyworld. Interstate 4 Highway is just 10 minutes away which makes other Orlando's premier attractions easily accessible. The main living area's open plan design is spacious allowing everyone to remain connected whether in the formal living/dining area, kitchen, breakfast nook area or family room. It boasts a spacious family room at the rear of the home with large flat screen TV and DVD player, large comfortable sofas to relax on. Huge double sliding doors open out to the pool area from the Family Room. The fully-fitted kitchen has everything you need. There is a large range cooker with overhead microwave/extractor and a fridge/freezer with water and ice dispensers. We have a comfortable formal dining area and a breakfast nook where you can enjoy early morning coffee with views of the pool and conservation. If you do not want to cook, then phone for a take-out - calls to all US numbers are free to our guests and you can also use the free wireless broadband internet access. 3 master bedrooms all with en-suite facilities, one being located on the ground floor with a bath tub and separate shower, a King bed with views over the pool area and conservation. Two further master suites with King beds are situated on the first floor, with bedrooms 4 and 5 being one King room and one twin room with shared bathroom. All bedrooms have TV's and hairdryers are supplied in the bathrooms. We have ensured that there is plenty fresh towels and bed linen available for your use along with a washing machine and tumble dryer. We have converted the garage into a games room where you can show off your skills on the pool table, organise your own foosball or darts tournament. The games room also has a 32" LCD TV, stools and a ceiling fan. Making it a great space for keeping the kids entertained, giving them hours of fun. On the first floor you will find the loft area, where you can relax on the comfortable corner sofa, challenge your family and friends to an air-hockey battle, or simply have some family entertainment watching a movie on the large flat screen TV or a game on the Playstation. We have a 30ft x 15ft private South-West facing screened pool & fabulous spa. 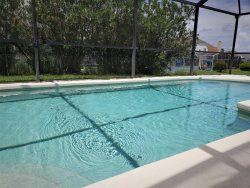 Our huge extended pool deck and lanai, backs onto natural conservation area with lake views. We have no rear neighbours making the area private and secluded. Our outside area is fully equipped with alfresco dining equipment, relaxer chairs and pool furniture. We can organise pool heating, BBQ hire, cot hire or a grocery starter pack to be in our home for your arrival. Please ask for further information and we will be happy to help.